A Color Wheel lesson with color schemes, combinations and Ittens idea. 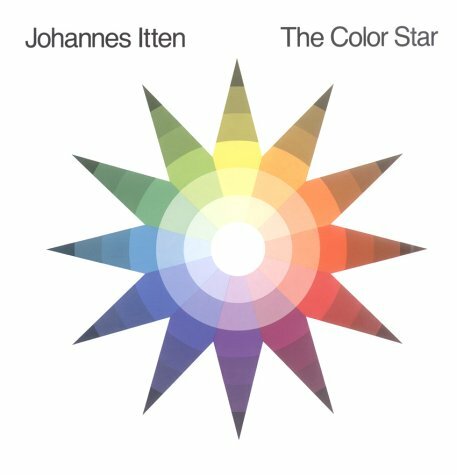 The Itten Color Wheel, Color Schemes, Combinations theory. If you’re serious about improving your art, you will need to understand these principles. 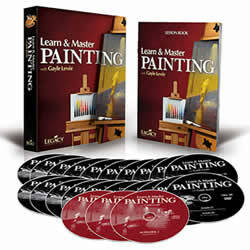 Without this knowledge, you will not be able to develop color schemes for your work. You don’t have to memorize it, but have it posted somewhere in your studio for quick reference. If you’ve enjoyed my little video on the home page, just look behind me on the wall! Yup! I have Ittens color wheel posted right there. I also have a bunch of notes posted there on mixing certain colors and proportions so I don’t forget! There’s also a very old color chart I created, but due to bad paper, and very cheap watercolors, it’s faded so badly, I can’t use it here. But let’s get started anyway! Did you know there are several color wheels. The first we will call the Mixing Color Wheel. Red, Yellow, Blue (RYB). It is your standard wheel you see in most textbooks and in paint stores. As time went by, another wheel was created. We will call this the Visual Color wheel. It is made up of the same colors, just a shift as to what is now Primary. Red, Green, Blue (RGB). Can you see the difference. One considers yellow as primary, the other considers green as primary. With advances in science, both in the optical world (color television) (Printing inks) and the biological world, it is now understood that the correct one is the 2nd one called a visual color wheel. We now know the human eye consists of Red-Green-Blue (RGB) receptors. Your color television is based on this idea, but it is the secondary subtractive triad of the RBG with its CMY (cyan, magenta, yellow) colors. Did you understand all that scientific jargon? I didn’t either. I used to when I worked on televisions for a living. It’s also used in all printing today. (Pull your Epson Print inks out and check the names on the cartridges) Now you can use that in a trivia game! So which is the best to use? Let's go back and review a little history. Leonard da Vinci and Leone Battista Alberti created our earliest writings on color principles. Isaac Newton came along and talked about primary colors. Then Moses Harris we believe created the very first color wheel. (Primary being only those colors that cannot be created using other colors being mixed). 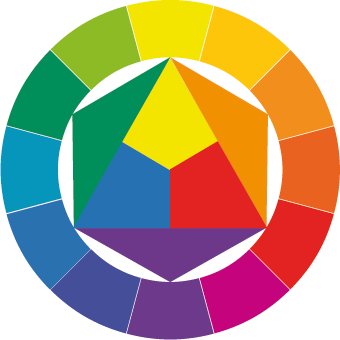 In the early twentieth century, Johannes Itten extended this wheel to include secondary and tertiary colors. He also included the idea of warm and cool colors and that any shade of color can either have a warm base or a cool base. Here’s An Ittens Color Star Chart featured twelve colors. 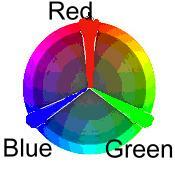 I like this color wheel better as it shows the primary colors in the center. The next ring out from the center are your secondary colors. And the 3rd combination (tertiary) is on the outer ring. You have 3 primary colors: Red, Yellow, Blue. TINTS & SHADES: Any color can be lightened by adding white, known as a tint. The same color can be darkened by adding black, known as a shade. Before we start discussing color schemes, take the time to visit these three links to better associate yourself with color wheels and color theory. They all open in new windows so you will not lose your place here. The first is a short PDF article that really explains the differences between the two wheels, and the other two are Wiki articles on each wheel. Now let's talk a little about color schemes. I’ll discuss this again in the color mixing lesson, but not in as much detail as here. 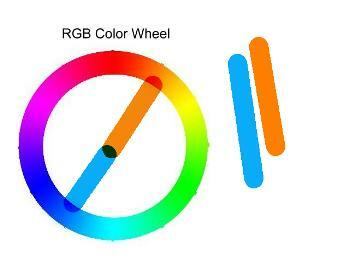 Because the human eye has receptors aligned with the RGB or “Visual Color Wheel”, establishing a harmonious color scheme within your work should start here. 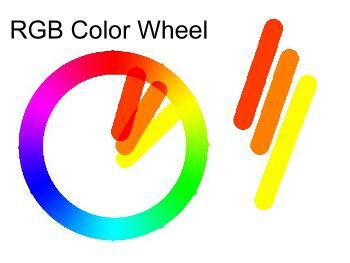 (With the RGB wheel, and NOT the RYB wheel) Once you’ve established your color scheme (most combinations are described below), then switch over to the “Mixing Wheel” (RYB) to help you in determining how to mix those colors. See the Mixing Guide lesson. Also, check out my Color Psychology, Color meaning to get an understanding about why certain color schemes work better in certain types of paintings. ﻿﻿﻿So, now we talk about just some of the ﻿﻿﻿color schemes that are out there today! The monochromatic color scheme uses a single color, and then variations in lightness and saturation. This scheme looks clean and elegant. Monochromatic colors will go well together, producing a soothing effect. The monochromatic scheme is very easy on the eyes, especially with blue or green hues. Use it to establish an overall mood. The analogous color scheme uses colors that are adjacent to each other on the wheel. One color is used as a dominant color while others are used to enrich the scheme. The analogous scheme is similar to the monochromatic one, but offers more nuances in a variety of colors. You can also include lighter and darker shades and tints of each of these colors to add even more nuances. 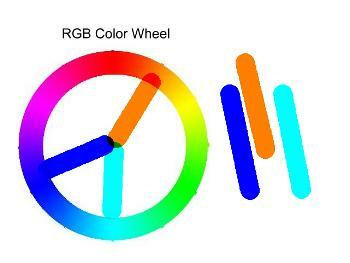 The complementary color scheme is made of two colors that are opposite each other on the wheel. The complementary scheme is high-contrast. When using the complementary scheme, it is important to choose a dominant color and use its complementary color for accents. Using one color for the background and its complement to highlight important elements, you will get color dominance combined with sharp color contrast. The split complementary scheme is a variation of the standard complementary scheme. It uses a color and the two colors adjacent to its complementary. This provides high contrast without the strong tension of the complementary scheme. 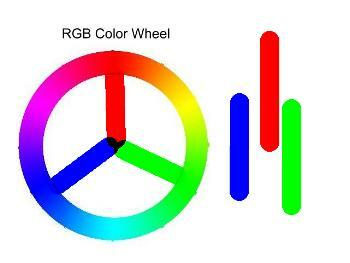 The triadic color scheme uses three colors equally spaced around this wheel. 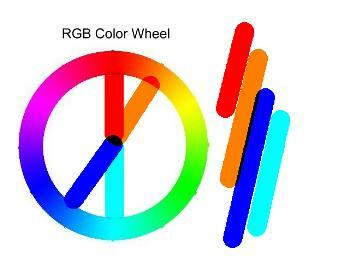 And remember, this is the RGB Wheel, not the RYB Wheel. This scheme is popular among artists because it offers strong visual contrast while retaining balance, and color richness. The triadic scheme is not as contrasting as the complementary scheme, but it looks more balanced and harmonious. The tetradic (double complementary) scheme is the richest of all the schemes because it uses four colors arranged into two complementary color pairs. Because all four colors are used in equal amounts, the scheme is hard to harmonize. It may look unbalanced, so you should choose a color to be dominant and subdue the other three colors. 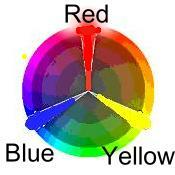 Most artists will use one of these last color combination's (or color schemes for their work). 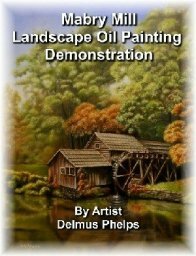 Try it on your next project and see how well your piece turns out as far as color balance and overall harmony of the work is concerned. 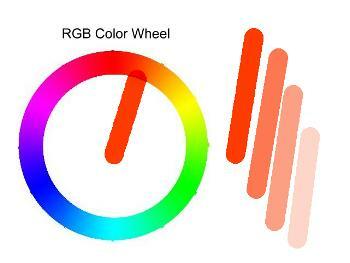 Also, keep that Color Wheel close by for reference! Click here to head back to the top of my Color Wheel page.